NOTE: I have decided to share this letter with my spiritual family, previous / present clients and students. I feel it is important for you to understand my perception of the changes she has made and I also have other things that I am being guided to share about her present stance on the teachings that I may have referred to you in our time together. NOTE: Please ignore my grammar and spelling mistakes if any! I hope you get something from my message and that you actually read it in spite of my sloppy grammar. I have so much to do today for my own life but felt compelled to write to you! I do remember a Spiritual Teacher on my path saying that if you see something and say “Someone Should DO Something About This!”… “YOU are that SOMEONE!! !” I think in this case that SOMEONE is ME!!! J (This paragraph is repeated at the bottom of this letter). I am not sure if you remember me, but I am one of your ATP’s. 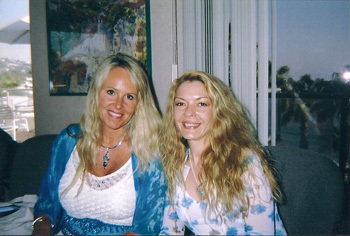 I worked with you in 2002 and in 2003 in Laguna Beach. I have helped out at Hay House conventions as one of your helpers when you came to Canada. I have felt a kindred spirit to you at a certain point in my journey! I remember when I had just one book of yours and one deck of cards (Healing With The Fairies) and while I read the one book KNOWING that you WERE to WRITE many more books to empower people! I have to admit your journey (You live yours in front of us all) has been a bit of the opposite of mine and yet many similarities about guidance during certain parts of our journeys. I was raised Roman Catholic and grew INTO my spirituality over time. I have always said that if I were to have had children, I would have raised them with religion and allowed them to make their own decision after. Meaning, I would have them baptized and any other rituals associated with that religion. I have to admit my journey has been challenging and by no means am I as advanced as you in the material sense of my physicality but I feel a real understanding of where you are from a spiritual perspective because of my desire to continue to grow. I am by no means a saint but I take my work with the beings whose life I touch very seriously! I know now that your ATP course was an answer to a prayer that I had put out to God on my journey. I had been reading a set of books called “The Life and Teachings of The Masters of The Far East” by Baird T. Spalding. In them they had said to be careful about the Tarot because when a person sees them and they are negative they may affect the person subconsciously! So I prayed for the “HIGHEST POSSIBLE READING” and was led to your work with the angels. I don’t want to go into great detail about the things that have come to mind about you during this transition but I just want to ask you a few questions to ask yourself and perhaps make a few suggestions that may hopefully benefit you in some way! I know you are very committed to the Bible that you are reading and Jesus. Truthfully I have always had a LOVE for Jesus but in my heart I never felt he wanted to be worshipped. This was just a feeling (I think because it would preach separation and this is what we as a human race are trying to overcome). I would like you to consider reading Shirley MacLaine’s “Out On A Limb”, I know it’s old but it refers to certain things that were struck from the Bible. I feel I am just reminding you this. I KNOW YOU KNOW THIS!!!! You Doreen are an amazing manifestor and you have had so many prayers answered! I am just suggesting that perhaps the reason why this has become a bit more difficult for you is because of WHAT you are reading in the Bible. I did do the “Course” myself (ACIM) and it said if it’s EFFORTLESS it’s from GOD! Is this effortless for you?! My goodness, I have to admit that I had a very hard time hearing the beginning part of your Q & A because in my heart I KNOW THAT the only thing that IS REAL IS LOVE! I finally could finish the video today and I cried. YOU DO NOT HAVE TO BE REJECTED TO MAKE A CONTRIBUTION TO HUMANITY AND HAVE A STRONG SENSE OF COMMITMENT TO JESUS! Please be careful on where you have decided to place your focus! I will do my best to hold the space of wholeness for you so that YOU REMEMBER THIS TOO! As far as I am concerned you have always had a strong connection with Jesus and GOD! I truly LOVE the affirmation when you get to the throat chakra with your Chakra Clearing (I memorized it). “I allow my Higher Self and the HOLY SPIRIT to speak through my today in ALL of my communications. I step back and let spirit lead the way and all of my communications are perfectly ordered and guided! Today everyone with whom I come in contact with benefits from listening to my words. Including myself "(I added that last part). I had come to learn that talking directly to the angels was not the END of my journey. It was the preparation of my own connection with my HIGHER SELF / GOD / HOLY SPIRIT. At a certain point of my journey they backed off so that I could discern my Higher Self / God Self’s wishes to experience on this planet. BUT, I did not have to let go of all of the teachings to do this and neither do you! I know you may need to have this experience for whatever reason you may have agreed upon before you came to this planet but in my heart I KNOW this will grow and change when you put ALL OF YOUR KNOWLEDGE IN PLACE PLUS THIS EXPERIENCE. As for the animals. The answer to that prayer came to me by somehow finding out about a gentleman’s mission and his name is Garnet Schulhauser. (I had been guided to help the stray cats in my neighborhood and had been questioning if what I was doing was correct or had I gotten carried away!) He has a series of books that Dolores Cannon’s publishing company has published and they are quite good. If you recall Betty J. Eddie and her “Embraced by the Light” book you will remember the “Drunken Man” story! I KNOW you read that book and even met Betty! Well, there are some interesting things that are a part of his journey that make it very interesting to me to have considered listening to his experiences with his guide and what he learned from him! He has some wonderful information about the animals here on the planet and from what I have gathered they are meant to be equals to us all and the food chain was intentionally put in place by those that seeded us here! I felt that what I got out of his mission was that the animals are aware that we may use them for food. They seem to be fine with this because they do eat one another to sustain life here on this planet. They DO NOT like the way we EXPLOIT them and MISTREAT them! This is the main problem here!!! That is why we sensitive beings are feeling pushed to love them. It is to treat them as valuable beings JUST LIKE WE ARE!!! That we all are equal and we ALL have a special right to be on this planet! Truthfully for years almost every day I listened to you invoking the Archangels at that 2011 Hay House Convention in Toronto, Ontario and in your prayer you called them our brothers and sisters (plants, animals, bugs and such), I do pay attention!!! 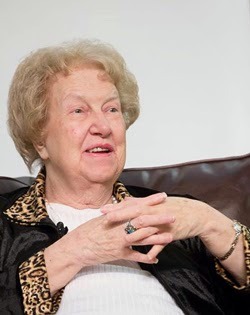 I am just sharing this with you because Garnet has done many interviews on You Tube and it may help to confirm the information I am trying to convey to you. I do understand that if you feel that this is where you must go I will honor that but I have to admit as one of your spiritual friends and students I cannot go on this part of your journey with you! I will LOVE YOU from where I am NOW and continue on my path as I was doing already! This is a brief video about how to recognize your life purpose or a portion of it and about how animals respond to our acts of kindness. I had a full time job in Niagara Falls for 12 years. Many things happened in my life and eventually, by choice, I left my job, and started to work toward my “Mission”. When I say my “Mission”, I mean my real, main life purpose. This entails teaching and educating people about the esoteric realm, angels, energy and topics of this nature. While I have been working on my business, I spend lots of time in my home. When you are working out of the home, you notice things that you wouldn’t have noticed as much when you are travelling to a job. I have noticed, especially in the winter, that there are lots of stray animals, especially cats that roam and have minimal amounts of food. I live in the north end of Hamilton, Ontario with lots of land nearby. I recently talked to a neighbor who found a live kitten in a garbage bag flung over a fence near the tracks! They rescued it. Animals left to their own devices is evident and unfortunate to see their helplessness, fear, and suffering. Seeing animals like this makes me wonder why they don’t realize they just shift the burden to others who cannot idly sit by seeing neglect and suffering. Others do care. I care. Since 2008, I started feeding a few animals at the back of my house. It was just a cat or two at first. Over time, my neighbor next door started feeding them, too. For a few years, we had a few regular cats that we were responsible for. We had our own indoor/outdoor cats as well as the strays. My neighbor moved in May of 2015. By them leaving, it disrupted what we were doing and our “joint” strays felt uprooted. The people that bought the townhouse next door were doing repairs and the cats didn’t feel safe to be at the back of the house anymore. I needed to let them know that I still loved them and wanted to continue to feed them so I put the food at the front of the house. By moving to the front, I couldn’t do this kind act discreetly anymore. Now ALL of my neighbors and clients started to see small shelters and food at the front of the house. I have to admit it has been a real journey for me. 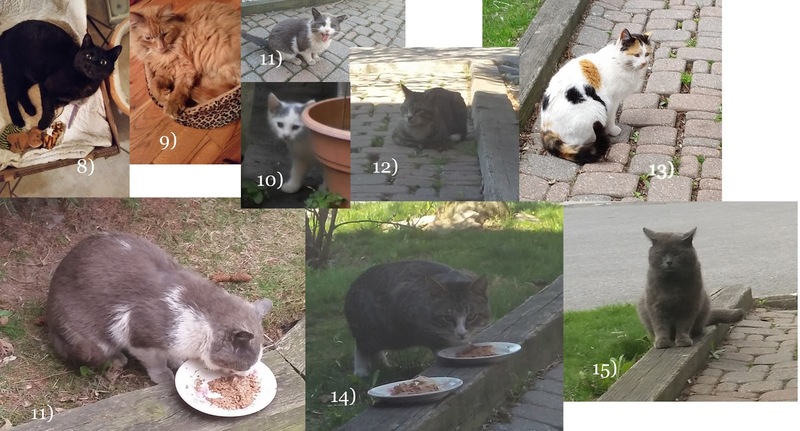 In this past year (especially this winter), I went from assisting 3- 5 cats that I was occasionally feeding to 12 – 14 cats (in truth maybe even more)! And in just a short time...OMGosh!!!! Not JUST feeding them but spaying them, de-fleaing them and trying to get them healthy. Until just recently I have been tending to this pretty much on my own with a few food donations from a couple of clients. I have met a few members that are a part of organizations, but on some level, they can only assist me so much. I really want to tend to some of the things when I want to and feel I have enough financial backing to do so. I am self-employed, and, if anyone has been self-employed, you know that there are no guarantees about how much you are going to make from day to day. It is spring now and all of these animals live outdoors or go outdoors partially. This means flea and worm prevention, yearly shots and spaying and neutering approximately 7 of them still to be done. And this is not to mention food and unexpected vet bills. Anyone that has an animal knows how expensive that this can be just for 1 or 2 animals, but now I have seemed to of inherited a colony! The truth is I had been praying for years to find a way to raise money to get these animals cared for. I didn’t even know that online financial assistance with a specific goal in mind was an option until recently. I am originally from Windsor, Ontario. A good friend of mine from there sent a calendar that was made with a goal to raise money for a group called “Earn Your Wings”. TNR services (Trap, Neuter, and Release) are provided throughout the city and surrounding areas through finances provided from the sales. I hadn’t opened the calendar until the other day, and of all things the April section had a profound share that made me weep because I feel that this is what I am being called to do. In the share, it suggested that if you see a stray animal that there is the potential that there are bound to be others in the area. One of the best solutions to stop the populations from growing is to do TNR. It was said that if we get “rid” of the animals by euthanizing them or moving them away, others will just come in their place anyhow! It was suggested to enlist the assistance of those in the neighborhood and educate them about this. Perhaps, even fund raise to make it possible to ease up on the expense of it all. So this is why I am reaching out to you! My goal is to get these animals healthy, vaccinated, and free of fleas. I also hope to get the remainder of them spayed and neutered so that they will get into less fights, stop reproducing and perhaps even soften and be adoptable by getting consistent loving care from me and perhaps others in the area…maybe even YOU. To make it even clearer to me that the assistance, I am hoping to get is needed NOW and not be put off any longer! One of the strays I feed arrived at my door this morning crying and having respiratory issues making it very clear to me that this request is sincere and timely! I want to thank you all ahead of time for your support and help, and I am sure these animals will be thanking YOU too! 3)Is TJ, he was my next stray. I started to feed him outside for about a year and then one day he finally let me pet him and the rest was history. He showed up sick, laid in my hands and I nursed him to health and fixed him and I had him until last year! He died suddenly of a blood clot. 4 4) Is Buster, he was an outdoor stray that my neighbor and I fed for approximately 3 years outside. He had a wounded leg for about 6 – 8 months that didn’t heal and I promised myself and God that if I had extra money I would help Buster and I DID!!! $1000.00 (thank goodness because I was really afraid it was a break and that could have cost a fortune) later and now Buster is alive and healthy! 5 5) Is Mask…I have been feeding him outside for 5 years he was a bit more friendly feral and seemed to like outside more than inside but at the same time as I was tending to Buster, Mask almost died. So of course I tended to him and nursed him to health and found out that he has FID “Feline Immune Deficiency”. I keep an eye on him now and got him fixed this winter so that he doesn’t make more babies and I can bring him in sometimes (most of the time). He LOVES it now!!!! 7) Charlotte (Named by another neighbor) she is one that may be able to be adopted out. She has been around for about a year. I tried to get her fixed but I didn’t find her on the day of the appointment! Crazy!!! 8) 8) Is Little One, she is a really lovely indoor/outdoor cat. I got her fixed this winter and she is the one who keeps these animals together. She is sweet agile and I just love this girl! 9) Is Lover Boy (I call him that because of how he got into my heart and home and also because he is a BIG FLIRT) He is neutered but is friendly and likes to knock on the door of my neighbors and they love him for that!!! Typical male I say!!! 10) Is Thumper, my neighbor took Thumper; he was from one of Mamma's litters. 11) Is Bandit, he is the one who has the upper respiratory issues. I just love this guy but I haven’t been able to pet him yet and he seems just tired and getting up there in age. 13) Is Cali she is pretty feral, she has been out here for at least 5 years. I know she is spayed because I have never seen signs of kittens. 15) Is Smokey he has been around on and off for about 4 years. He has had numerous injuries and has a welt on his head as I write this. I feel if he is neutered he will have a better chance of getting into less fights. 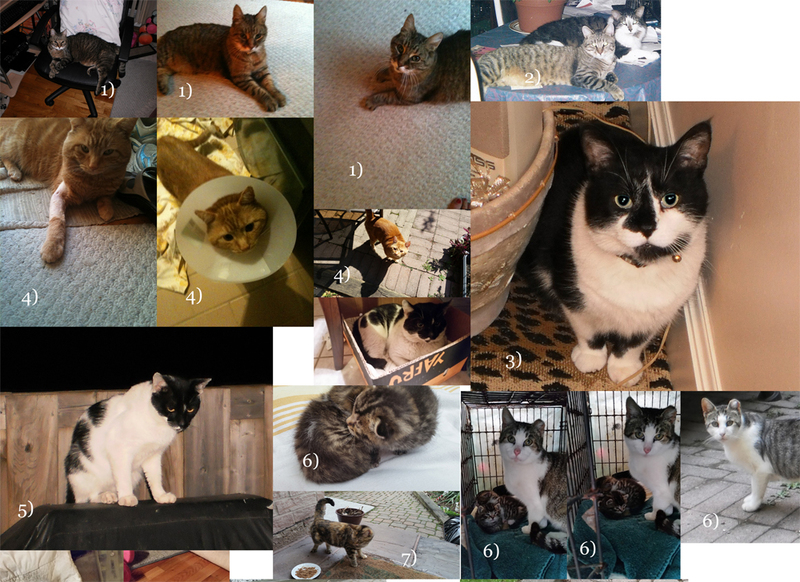 16) There is one more guy but I didn’t get his picture yet in the collage…I haven’t named him yet! I had a healing session with you in May, 2014, although the Past Life Regression OR Quantum Healing Hypnosis Session with you didn't turn out quite the way I had hoped, it opened my mind to many more possibilities then I ever imagined! I thought you might like to know that ever since our session I have NO MORE ARTHRITIS PAIN AT ALL!!! I have had arthritis that was progressively worsening, taking pain medication almost daily and a little worried about my future. I have also noticed almost NO MORE BACK ISSUES; something that over my life I had many problems with. Now almost no problems and I LEARNED THAT with a lot of gardening over the summer. Something that used to ruin me! I have not done anything that would have helped me in these areas so it must be our session that has made the difference! Thanks for reading and sharing joy in the success of my work!!! Recently I was sent a client that had asked for me to serve her by performing one of my Psychic / Medium Readings. When I tuned into the women I was given clear guidance about the necessary things I was to do with her, the healing work that was required and a VERY CLEAR MESSAGE THAT SHE WOULD NOT LOSE HER HOME AND THAT A MIRACLE WAS GOING TO HAPPEN!!!! I was also told that she must be careful because if she placed too much worry around the situation and did NOT LET IT GO (offering the issue like an envelope to them and letting it go) she would not LET THE MIRACLE HAPPEN! When I was doing the reading for her I used the Archangel Michael cards and it confirmed that she was going to be taken care of from the cards that presented. I prayed during the session and had the angels working with her over a period of time and they gave her this amazing sign that weekend! She called me the day it happened and asked me what I think it meant. 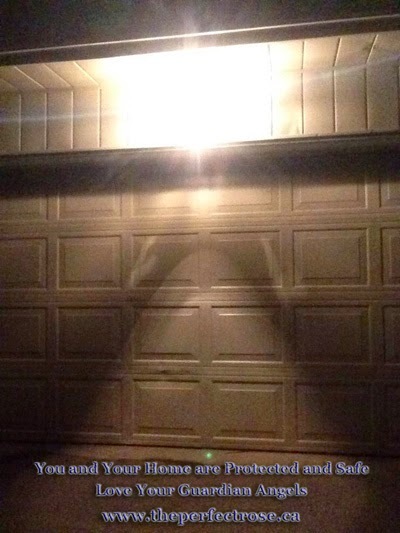 She said that her husband had changed the light bulb on their home over the garage door and when her son had gone to the store that evening and upon his return home the image above is what he saw on the garage door of their family home. The son took a picture and brought it in to show his mother he even brought her outside to see it but she COULDN’T see it at first. I said, “Listen Dear (we are not going to use names here) the angels are telling you that they are working day and night to protect your home!!! This is a clear sign that the angels are working to assist you in keeping your home!!! Can’t you see it? After a short conversation and some encouragement on my part and from the angels, she finally accepted the SIGN and worked on releasing more fear and letting it go. Needless to say she DID RECEIVE HER MIRACLE AND WAS ABLE TO KEEP HER HOME! I am asking you this question now. Do YOU see the angel figure on the door?! I am asking for those of you who DO see the angel on the door I am sending you extra angels to assist you in moving through that one important part of your life that isn’t working and asking for them to assist YOU and having your OWN MIRACLE with a VERY CLEAR SIGN! NOW, for those of you who DON'T YET SEE the ANGEL ON THE DOOR I am asking for the same thing for you but first YOU MUST BE WILLING TO WORK WITH THEM AND BREATHE OUT NOW ANY FEARS AND DOUBTS THAT ARE PREVENTING YOU FROM SEEING THE ANGEL ON THE DOOR! We are asking that only love and light be put in the place of anything you let go of and that this be for your highest good! I am also asking that the angels work with you in the next 2 weeks to chip away at these fears and assist you in experiencing the really cool miracle offered as well!!! Please feel free to me email me and let me know about your miracle. I would love to share it with others and I promise I will not use your name if you don’t want me too! Miracles DO happen and the more we share them the MORE THEY HAPPEN FOR OURSELVES, OTHERS AND THE WORLD! LET’S FILL OUR LIVES AND THIS WORLD FULL OF MIRACLES!!! Sending YOU Lots of LOVE and Angel Blessings NOW!!!! It is truly a fun and affordable way to create SOME AMAZING THINGS IN YOUR LIFE!!! So far it feels like you can jump in anytime you'd like or try just one class and see how it feels. I'd LOVE to see or hear you there, think about it. I regret to inform any of my Dolores Cannon clients and friends that my teacher of the QHHT modality I utilize has left the body and moved into spirit. "It is with a heavy heart that we let you know Dolores passed away this morning. To this end she was the Dolores that we all know and love and we want you all to know that she appreciated very much the loving energy and prayers you sent her way these last few weeks. She was with all of her family this morning and left surrounded by their and your love. Her heart will remain connected to us all." I am just wanting to let you know that I am intending to place a free card reading program for you to get some fun messages from my blog here and also on my website. I am looking forward to see you have some fun with these and please know this is just for entertainment purposes only! An Apology and a Special Message About My Work! I know it has been awhile since I have sent you a letter. I have to admit that when someone got a hold of my contacts I was a bit set back! I did my best to make sure there was no virus on my computer before I would even think of reaching out to you. I will apologize but yet I don’t feel a strong sense of responsibility for it because I didn’t have it on my list of things to manifest ;) One thing I WILL tell each of you. I have never sent just a link out in a mass mailing and even though I study many things I would not push a product like that! I may make suggestions to view things I have available but I rarely push. So in the future please know that if you see an email like that it will not be from me. I did decide to change the address that my letter comes from. I do want to share the miracle in all of this. So, if you were interested in the Raspberry drops one of my clients wrote a suggestion to me and I will include it here. “So...about the Raspberry Ultra Drops...while there is evidence that Raspberry Ketones help to burn fat the actual Raspberry Ultra Drops in the link you sent me is a scam; so don't order from there. NOW!!! Let’s get on to the fun and important stuff!!! I have been guided to have a “Summer Solstice Group Meditation” on June 20th, 2013. It will be available for those in person or at a distance. I recently have found a way to perform this through video so we may even try it that night as well! I have also placed an interactive calendar on my events page to let you know the dates of some upcoming classes and ideas of what I will be teaching. This way if I don’t have time to do the work on all of my pages you can still see ahead of time the classes I am intending to hold. Please check the events page from time to time because if a class is not a “GO” I may be changing it there first! I also will be performing a “Past Life This Life Regression Class” near the full moon on Saturday of June 22nd, 2013; this will be an evening class by request of one of my students. This full moon is meant to be a pretty powerful one so it would be a great idea to use it to our advantage! I had to share this with all of my followers to confirm of the upcoming changes and also to confirm of my own guidance that came directly to me of my upcoming conference call series. I came across this information later and I thought it best to share with you for I feel it explains what I feel in my heart as I am guided to assist my friends and loved ones through the transition we are going through at this time. They say when two or more gather "miracles happen". Fasten your seat belts. We have ALL been preparing for this Cosmic Moment for Lifetimes. Know that the end result of this amazing ride is going to be glorious. Remember, you already have within you everything you need to fulfill your part of this Divine Plan. Enter your heart and from within the sacred place of the Most High Living God, ask your I AM Presence to reveal to you the magnitude of the opportunities unfolding on Earth at this time that will allow YOU to add to the Light of the world. The first step of this 40-day process begins today with the influx of Light that occurs every year on November 11th, 11:11. This year we are experiencing an exponential expansion of the Light that was anchored last year, in the core of purity, in every electron of precious Life energy on Earth. That occurred during the 11:11:11 celebrations of November 11, 2011. That influx of Light activated Humanity’s pineal glands and began the initial impulse of Earth’s Ascension into her new 5th-Dimensional Solar Reality. That event greatly expanded our new Planetary CAUSE of Divine Love. The success of that facet of the Divine Plan paved the way for the Birth of a Renaissance of Divine Love which occurred during the 25th Anniversary of Harmonic Convergence in August 2012. The devastation that took place in the United States of America during Hurricane Sandy was heartbreaking, but the number of people who survived that powerful purging process was an act of Divine Grace. The positive thing that seems to always happen when this kind of tragedy takes place in the world is that people everywhere revert to the inner knowing that We are One and that there is no separation. Even the least likely people open their hearts and with love, compassion, and genuine caring they reach out to help their sisters and brothers in the Family of Humanity. In these painful situations people around the world invoke the Light of God on behalf of those who are suffering, which gives the Company of Heaven permission to intervene in awesome ways. It is a great benefit, and not by chance, that we are entering this important phase of the Divine Plan with the hearts of people everywhere open to full breadth. I have decided to share this information to empower some of my friends and clients that may be going through some big changes in their lives. I have recently found some of this information through a few sources and then after I received this information I have been sent a few people that have been diagnosed with cancer and especially those with tumors. So I feel in my heart that any type of information that can be shared may be beneficial for them to use and perhaps perform some research of your own with. I had hoped to post the information on my Blog with the You Tube videos but it appears as though this may not work so I will place the rest of the information and have it available on my website linked to this page. Please view http://www.theperfectrose.ca/articles.html and you will receive the rest of the information. Most people know that water covers 2/3 of our planet & comprises 95% of our bodies; we simply cannot live without it. In Chinese element theory, water produces wood, which signifies growth and is the natural element of the dragon. 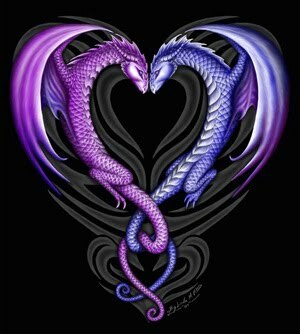 The dragon governs east/southeast, wealth accumulation & the hours of 7 a.m. - 9 a.m. Associated with thunder, lightning and arousal, the Water Dragon personifies creativity at its best. Water Dragons occur every 60 years, so we have had Yang Water Dragons in 1952, 1892, 1832, 1772, 1712, 1652, 1592, etc. Too, the future holds more Water Dragons in the years beyond 2012, in 2072, 2132, 2192, 2252, etc. Embrace the upcoming 2012 Year of the Water Dragon! Star gate activation to align our bodies with the crystalline grids in preparation for the 2012 energies. If any of you have noticed many of our bodies and lives are going through big changes.Some people are becoming allergic to things that they may never have been before and others are having anger coming up that they don’t even feel justified in having; some are going through huge emotional changes, happy one minute and depressed beyond measure the next.Others of us are going through periods where we require more sleep than usual or our bodies don’t feel as energetic as they felt even 6 months ago (or if they do it is not consistent).Some of you may be having chest issues (colds and such), heart palpitations that may make you feel like you are very anxious and you don’t even know why.You may even go to the doctor and find out nothing is wrong with you.The reason behind this is that there is nothing WRONG with you.We as a group on the earth are going through a huge energetic shift some of our past life issues are coming up to the surface and this is a way that the body can heal and transform these energies and assist s in living in this lifetime NOW.The earth is going through her own changes, the weather is different than it has been in other years, the conditions and climates on some level are changing in many areas.There are different storms and disruptive activities that are happening everywhere around the world.The reason for this is that we are making a huge energetic shift, the crystalline energies that are in and around the planet are moving to higher frequencies and for our bodies to move with it we must align to these new frequencies to make the transition in a much more graceful manner.I have been instructed to form a mediation on 11/11/11 a day which is a portal to assist ALL in all areas in connecting more deeply to these energies and prepare the body for the shift and changes that will be coming as we move into 2012.This date is a special date and in many ways a portal in which the crystalline grids will be waking up to bring in some even higher energies to the earth.Seeing as we live on this earth wouldn’t it be beneficial to have our bodies align to the crystalline frequencies so we can be working WITH the energy instead of AGAINST it on some level? I have been guided to start the night of working with clearing or energies of any karmic debris ( a forgiveness process) that may be holding us back and then after this have us connect as a group WITH and TO the crystalline formations around the planet as they are moving to a higher frequency.It will be a pretty POWERFUL session and my intention is to make this available for people to be in person with me or at a distance through a phone conference line.I look forward to seeing or hearing you on this day and welcoming in the energies to assist in making this transformational shift into the new earth energies in 2012 a pleasant one. I've decided to share my experiences with numbers and angels to let you know how they can make an impact on your life! I have been working with the angelic realm for years and have found one of the easiest ways to develop a relationship with them is to give them permission to assist you in all areas of your life (the angels) and let them speak to you through numbers! This can occur in amazing ways like on clocks, license plates and even receipts for things you have purchased. I have found that at first they seem to always get your attention with the 444 which means; "the angels are surrounding you now and are here to assist you in all ways!" You would be surprised about how many people I know that have told me that they were either pulled to the clock through the day at 444 or even awoken in the middle of the night at this time. I would encourage you to purchase a book by a wonderful author and one of my teachers; for you to really have fun with this. It is called "Healing With The Angels" by Doreen Virtue. This will give you a little bit of background information to assist you in opening your mind to their assistance and also at the back of the book there are a combination of number sequences available to assist you in having a place to start your adventure! I look forward to hear about your experiences and to see what your angels have in store for you on your exciting journey through life! 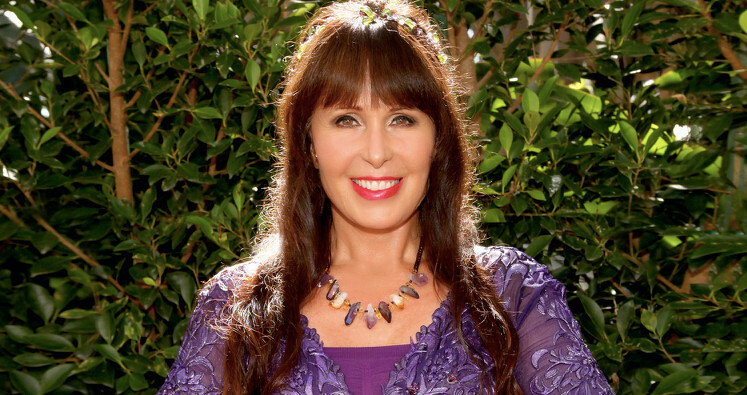 It's Rose here and I will be sharing some of the wonderful experiences that I have had with the angelic realm and also share some spiritual knowledge that has changed my life on such a profound level. I look forward to make a positive contribution to your life and open your mind and heart in such a way that you will believe that these things can change your life as well.